The difference between bacon and salted pork or ham is primarily just the composition of the brine that is used to cure it. 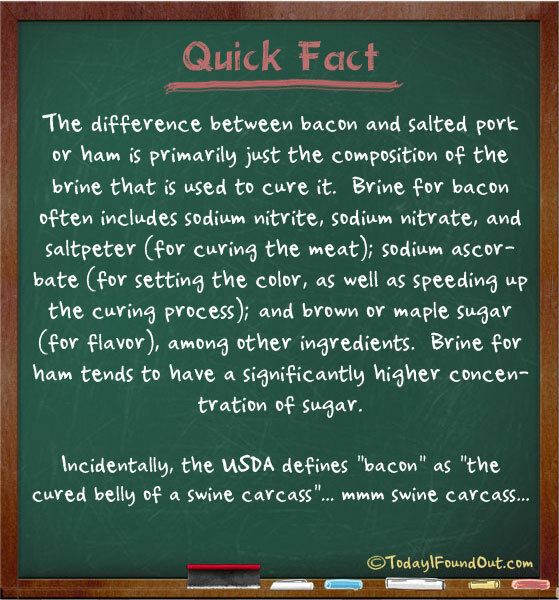 Brine for bacon often includes sodium nitrite, sodium nitrate, and saltpeter (for curing the meat); sodium ascorbate (for setting the color, as well as speeding up the curing process); and brown or maple sugar (for flavor), among other ingredients. Brine for ham tends to have a significantly higher concentration of sugar. Remember, swine is just one letter more than wine!